This modern semi-detached house is right on the beach front at Carnac, simply stand and look out the window and the sea is right in front of you....look, so definitely a case of location, location, location!! Downstairs is all open plan and light and bright, with ample seating. French TV, music centre, and beyond, the large dining table and ample seating for eight people. The kitchen is well equipped with more pots and pans than you will ever need and also benefits from an electric oven and ceramic hob; dishwasher; microwave; large fridge and freezer and in the utility cupboard you will find a washing machine. In the hallway you will find a downstairs toilet and sink. Upstairs there are two further floors, right up top you will find a room ideal for children or teenagers, there are twin beds in a large room with a shower room opposite. On the first floor there is a master bedroom with king sized bed and ensuite shower room; one twin room and a double room. All bedrooms have built in wardrobes, bedside cabinets and sink units. 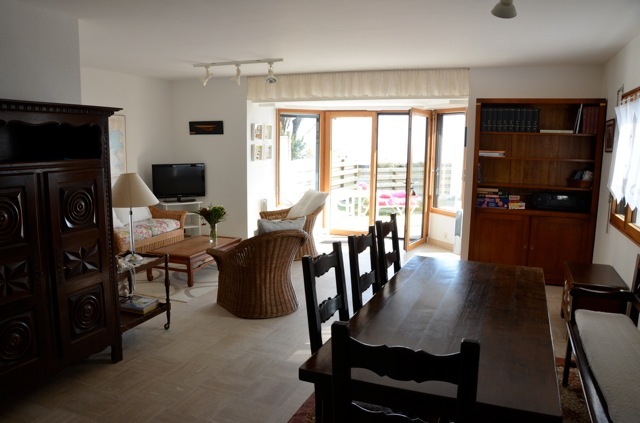 The double room and the master room have full sea views and the twin room has views to the side. There is also a family bathroom with bath and shower over, and separate toilet. The furniture is very good quality, beds from Ikea. Outside there is a long garden to the back and the side leading down to the beach. The garden is enclosed with access to the beach and sea via a gate. There is a large garden table, chairs and a couple of sun loungers as well as the all important sunbrella. Only 400 metres has you in Carnac village with its shops and restaurant, so everything is at your doorstep. There is no linen provided at this house, but can be hired (see panel below). Pillows, quilts, mattress protectors are provided. End of stay clean is included. In July & August ONLY fortnightly bookings are accepted.